Original post March 7, 2012 at 5:48 p.m., updated March 7, 2012 at 6:22 p.m.
Florencia Ramirez is on the “eat less water” diet. From her kitchen in Oxnard’s historic district, she serves meals made with ingredients grown on “dry farms,” or with limited amounts of water, and she’s teaching other local residents to do the same. 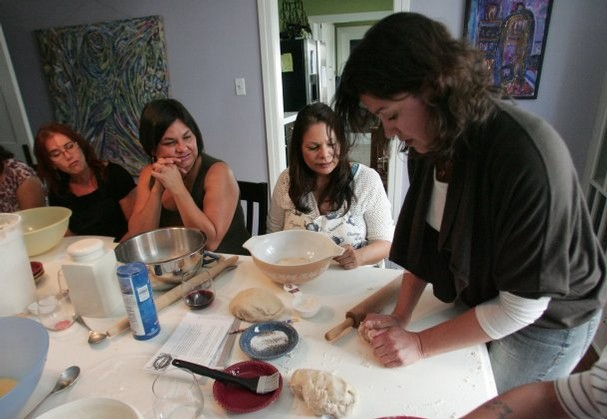 Ramirez held a cooking class Saturday in her home, teaching eight area women to make pizza from scratch and “eat less water” in the process. “Eat less water” is a trademark phrase for Ramirez. It describes her push to reduce the amount of water used to irrigate farms, thus helping conserve the natural resource. It’s also the title of her blog, eatlesswater.com, and a book she’s working on about her research of dry farms, which use only rainwater or other precipitation to irrigate. Experts predict two-thirds of the world will experience water shortages by 2025, Ramirez said. Kneading pizza crust made with dry-farmed olive oil and organic flour, Ramirez taught the women in her class how to help save water when shopping for groceries. Read the full article at VC Star and view all photos.